I think you're missing having hit a switch. You can see them in your map. Just check they're all down. Where your green pen is in the far southeast is a switch. I can't see it because I think the pen is hiding it. Thanks. One last question: how do I rescue Merlin? I got the spell of conjuring but can’t open the last door in the Province of Conjurers? Which door.? I’ve used it on every door in the enclave with no effect. Merlin is in the Province of Conjurers. As Aeon says, use the Conjurer's spell on that door. I am completely stuck in the Enclave as well. Have found and hit all Six switches and killed all sceletons. Still nothing. Btw the place where you are supposed to track progress does not show any. Just original language around “you can track your progress here”. What am I missing"? Shouldn't be there seven switches...? 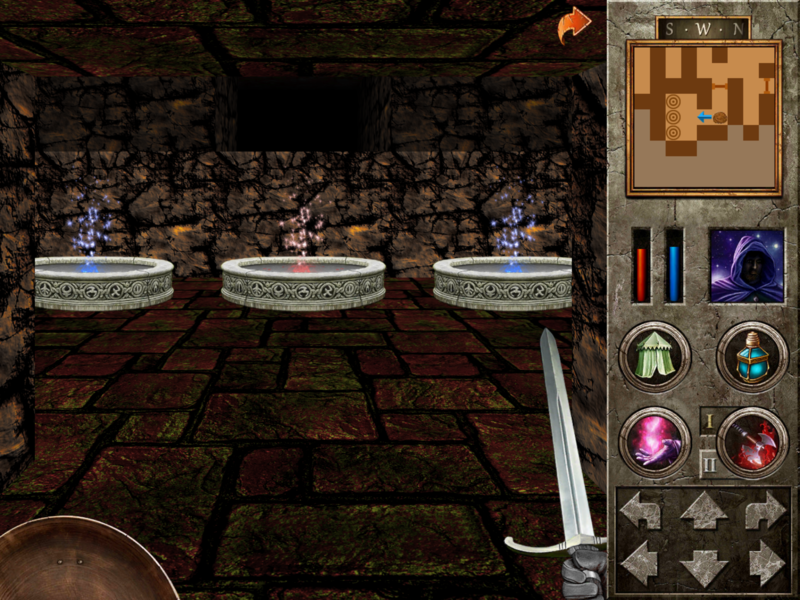 You need then to discover teleport, which has a different color among the others. The message when you touch the door says six switches. I have found 4 teleporters in the main area 3 of which just send you to a different part of the main area. The 4 th sends you to a hidden room with the 6th switch. Am I missing a hidden wall? to get into different teleport, which sends you further. Hope it helps..
You are standing in the area I can’t get into as it requires pushing switches/killing sceletons. I have attached my map below with 5 of 6 switches marked with the green pen - the 6th is in the area below the edge of the map on the bottom. Have you tried each and every teleport in your map? If I remember correctly, one of those helped me to get behind. But also I remember that I used lockpick skills on one of the doors somewhere (unfortunately do not remember which one). Yes. Tried all teleporters. One does indeed lead to the separate area on the bottom. Can’t remember if I had to pick any locks but have opened all available doors except for the one I am standing next to. The room in the very center on the map has a door that is not open. But not “pickable”. Just says “no answer” when I tap it. Cat - any suggestions from you? Then sorry I cannot help more. It just worked for me. Thanks for trying. Hoping Cat has some suggestions. I put eight skeletons and six switches just in case someone had trouble with this. So if you flipped all the switches, maybe you missed a skeleton? 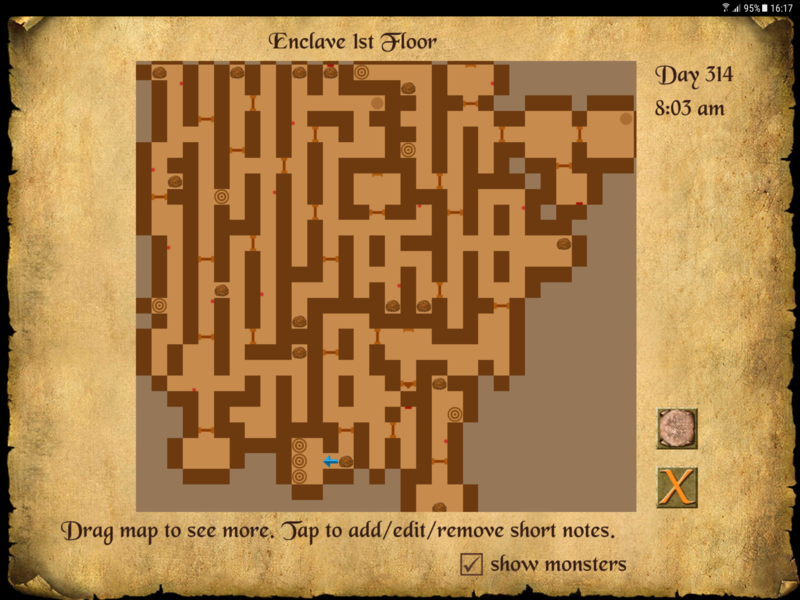 If you've killed less than the required number of skeletons or flipped less than the required number of switches, it should say, '"Press six secret stones and find seven ravenous bones---send them to their rest to pass my test." Otherwise, it should just open if you tap it. You might have a glitch of some kind. Maybe try sleeping in an inn for 21 sleeps and go back. @Aeon ----Thanks for all your help. Thanks Cat. I was referring to the small door in the center of the map saying “no answer”. 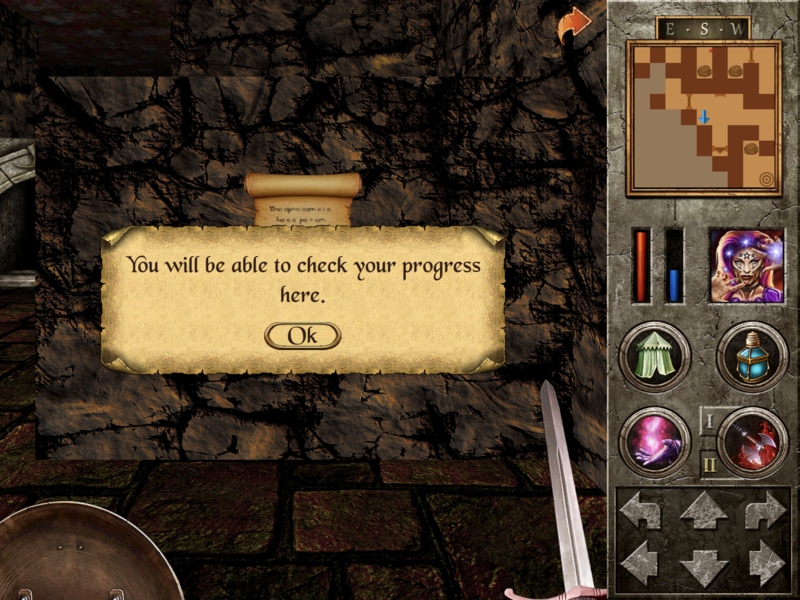 The parchment text has not changed since I first entered the dungeon - pic attached. Despite killing all skeletons and pushing 6 buttons. I guess it is a glitch? I’m playing on iOS. Will try sleeping 21 times. Tried sleeping. It brought back 6 Seoulbreakers but did nothing for fixing the issue. I am hoping I’m not out of luck. I had same situation on Android (no progress and locked door with no answer), but it did not block me to go through Enclave successfully. That must be a mobile glitch of some kind. If you can send me a save file, I can send it to Elendil. My progress always showed. We test on Steam. Elendil does not have the time to test on mobile. It drove me crazy actually that my progress showed because I was short killing one skeleton. But we all got through in testing. No one had a problem. If you can't get through that gate, my guess is you either missed killing a skeleton or you missed a switch. Are all your switches turned down? The door that says 'No answer' -- has no one on it. It's just a door. As I wrote Cat, on Android this glitch has no negative effect on game continuance, as I went through. I will try to take a look for saved file, will be back soon. This was the same issue I had. All skeletons are dead and switches hit, but the door wouldn’t open. This seems to be a random mobile glitch of some kind. If you have a save file, you could send it to elendil@@redshift.hu so he could take a look. So many people have finished though that it seems to be something random, not something I have any control over. You would need to send him your save file at that spot and let him know your device, probably also whether you're playing the embedded or standalone game. I have to take back my previous statement. I´ve seen no progress at the wall sometime at the beginning, but when I return now to this place, notice on the wall shows correct progress. I think this is something for Elendil to look into. The code there is the same kind of code where you could check for number of thieves you killed to get a bounty in other expansions. 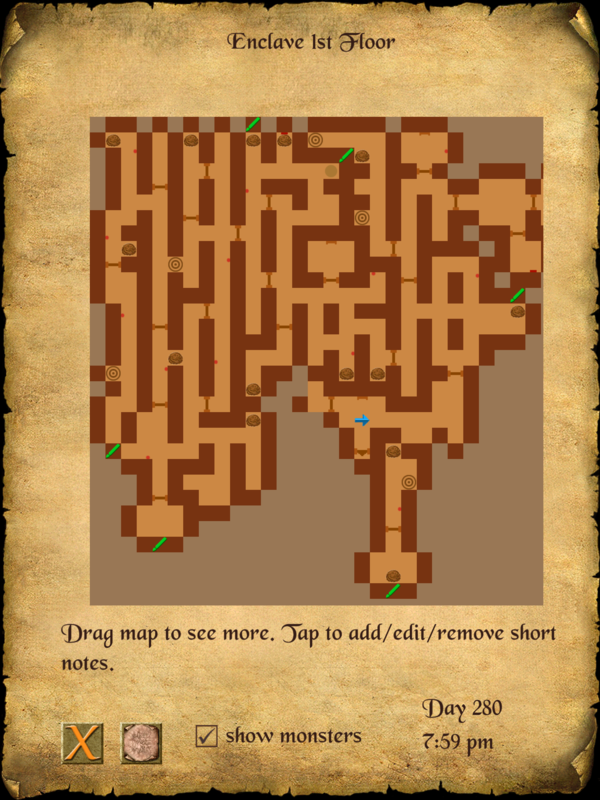 I think sometimes on mobile if you have all the expansions enabled, you might get this kind of random problem because the engine has to search so many places. I encountered the same bug. Playing on iOS. 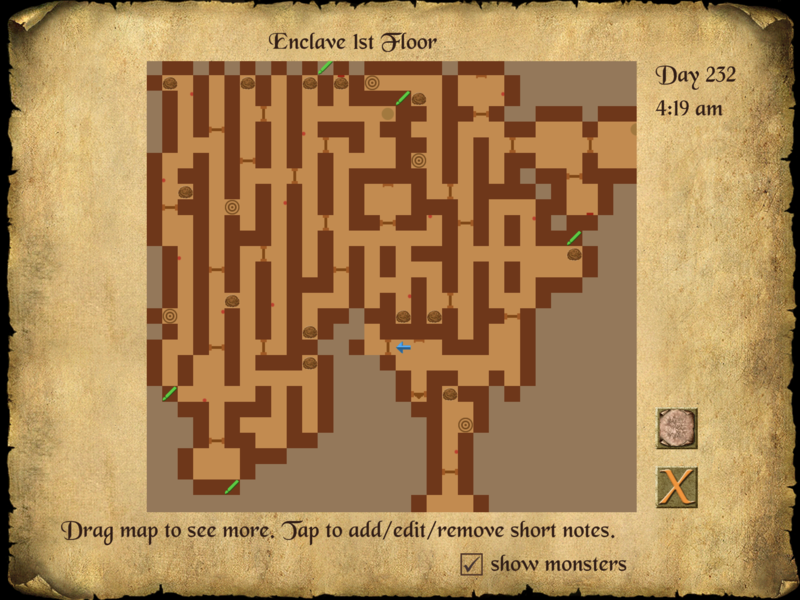 I pushed all 6 switches, killed at least 7 skeletons, but the tally does not show, and the door will not open. I slept 25 times, returned, but the problem persisted. Although I am halfway through the game, I tried starting over at the beginning, and went straight to the enclave. This time, the tally works fine, and when unlucky 13 is reached, the door opens just fine! So I guess there’s not much choice but to continue playing my new game (replay from the beginning) . Lots of quests to redo, but don’t really mind, as I enjoy these games so much. Too bad about this bug though, and seems it could reoccur in future expansions. Is there some way to disable the previous expansions? I think there is but you have to write elendil@redshift.hu. I don't want to give you misinformation. Things change but he always knows the current situation.